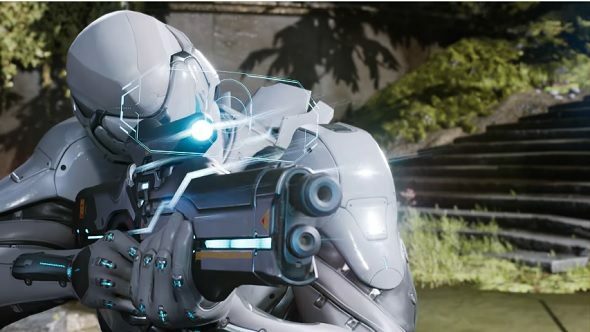 Moving on from lifeline-throwing supports and demonic bounty hunters, Epic Games have returned to sci-fi for Paragon’s next hero. Using a high-tech sniper rifle and advanced cloaking technology, Wraith is one for players who like picking off foes from afar. Find out which MOBA is right for you with our helpful guide. Epic are clearly fans of Deadpool, as Wraith cannot stop quipping as he blows the heads off of his opponents. His RMB is “Knock, Knock!” where he is able to shoot through walls with a high-powered rifle round. If Wraith players manage to kill an enemy minion or hero with this wallhacking shot, it refunds the mana cost and reduces the cooldown on the next cast of Knock, Knock! To use this move effectively you’ll need to see through walls. Luckily, Wraith’s Q – called “Who’s there?” – is a short-range sonar pulse that reveals any enemy heroes in the area, regardless of line of sight restrictions. As a sniper, Wraith is not the hardiest of heroes and will likely be turned into a fine paste if anyone gets the jump on him. His E, “Back it up!” is perfect if you need to make a quick exit, as it warps any enemy back to their position from moments ago. While your opponent is wondering where they are, you can slip away and find a new firing position. Wraith’s R is “Surprise, surprise!” where he transports himself and any nearby allies to the Shadow Plane for a short time. In the Shadow Plane, Wraith and pals are invisible and gain a movement speed boost. When performed with fellow hard-hitting heroes nearby, a successful cast of Wraith’s R can lead to one devastating ambush. As with every new Paragon hero, Wraith will be entirely free for you to play when he launches on June 27.